Beth Ebert: has been named as a Fellow of the Australian Meteorological and Oceanographic Society. John Le Marshall: has been named as a Fellow of the Australian Meteorological and Oceanographic Society. Dr Steve Rintoul gave the Malcolm McIntosh Lecture titled “The Southern Ocean climate change and Totten Glacier”. In 2001 CSIRO established an annual public lecture series in memory of Dr Malcolm McIntosh who was Chief Executive Officer of CSIRO from 1996 until 2000. Dr Beth Ebert: Beth was awarded the 2015 R H Clarke Award by the Science Committee for the Australian Meteorological and Oceanographic Society (AMOS) at their 2015 annual conference in recognition of her scholarship and international standing. 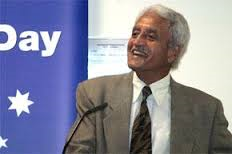 Dr Kamal Puri: Kamal was awarded a 2015 Public Service Medal for outstanding public service in meteorological science, particularly Numerical Weather Prediction. 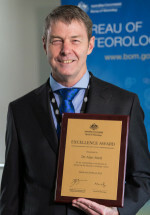 Dr Alan Seed: Alan received this award for his outstanding contribution and achievements in radar science and application, particularly in quantitative radar rainfall estimation and short-term rainfall forecasting. Martin Cope: Martin was awarded the Clean Air Medal from the Clean Air Society of Australian and new Zealand. This is the most prestigious award given by CASANZ and recognises Martin’s innovative and excellent contribution to air quality modelling in Australia. Melita Keywood and Fabienne Reisen: Melita and Fabienne received Certificate of Recognitions from the Clean Air Society of Australia and New Zealand for their significant contributions to the understanding of the air quality impacts of a major emergency on the local community and environment – Hazelwood Coal Mine Fire 2014. Harry Hendon: has been named as a Fellow of the American Meteorological Society. Melita Keywood: was elected to the role of Vice-President of the International Commission on Atmospheric Chemistry and Global Pollution (ICACGP). John Church: was appointed a Fellow of the American Meteorological Society. Terry O’Kane: was appointed Adjunct Professor at the University of Tasmania. Simon Marsland: was appointed member of World Climate Research Program (WCRP) Working Group on Coupled Modelling. Bernadette Sloyan: was appointed to the position of Oceans Observations Panel for Climate (OOPC) co-chair. Simon Marsland: was appointed co-chair of Climate and Ocean-Variability, Predictability and Change (CLIVAR) Ocean Model Development Panel. Oscar Alves: is replacing Gary Dietachmayer on the JSC/CAS Working Group on Numerical Experimentation (WGNE). Paul Krummel: has been invited to serve on the Advisory Committee for the 18th WMO/IAEA Meeting on Carbon Dioxide, Other Greenhouse Gases, and Related Measurement Techniques (GGMT-2015) at the Scripps Institution of Oceanography on 13-17 Sep. 2015 in La Jolla, California. Kathy McInnes: was invited by the co-chair of IPCC WG1 to join the steering committee of a workshop on regional climate projections. Ian Galbally: has been invited to join the WMO Tropospheric Ozone Assessment Report (TOAR) scientific committee. An article by Sarah Lawson et al was selected by EGU journal editors as one of particular interest and was highlighted in the January 2015 EGU newsletter (Lawson, S. J., Selleck, P. W., Galbally, I. E., Keywood, M. D., Harvey, M. J., Lerot, C., Helmig, D., and Ristovski, Z.: Seasonal in situ observations of glyoxal and methylglyoxal over the temperate oceans of the Southern Hemisphere, Atmos. Chem. Phys., 15, 223-240, doi:10.5194/acp-15-223-2015, 2015). An article by Xianyu Wang et al has been selected for the cover of Environmental Science: Processes & Impacts Journal (Wang X, Kennedy K, Powell JP, Keywood MD, Gillett RW, Thai P, Bridgen P, Broomhall S, Paxman C, Wania F and Mueller J (2015) Spatial distribution of selected persistent organic pollutants (POPs) in Australia’s atmosphere. Environmental Science Processes and Impacts., 3, 17, 525-532, 2015: 10.1039/c4em00594e). CAWCR NextGen Staff: On the 14th of February 2014 the Bureau was formally informed that its Next Generation Forecast & Warning System Project (NexGenFWS) and the Geospatial weather viewer MetEye was selected by an external panel of jurors to receive the Geospatial World Technology Innovation Award (Meteorology). CAWCR has provided much of the science, forecast process, guidance and forecast text underpinnings of NexGenFWS. The Project is a collaboration across Bureau Branches including Services, ISS, BMTC and CAWCR. Geospatial Media and Communications confers these annual “Geospatial World Awards” on institutions or entities who develop innovative geospatial tools and products; implement conducive policies and apply geospatial technologies for delivering efficient results in the most resource efficient manner. Dr Jorgen Frederiksen: Jorgen has been invited to give the R. H. Clarke Lecture as the Opening Plenary Lecture of the 2014 AMOS Conference. R.H. Clarke Lecture is an invited review lecture presented annually by an expert in an aspect of meteorology or other related subjects. Tim Cowan: CAWCR scientist Tim Cowan, who is also studying for his Ph.D. at the University of New South Wales, has won the prize for best journal paper by a student in the Climate Change Research Centre for 2013. Tim’s paper was published in the journal Scientific Reports, and was titled ‘Forcing of anthropogenic aerosols on temperature trends of the sub-thermocline southern Indian Ocean’. 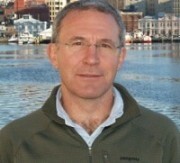 Dr Jeff Kepert: Jeff is recognised for his exemplary scientific research, leadership, and stakeholder engagement skills. He has made profound contributions to our understanding of tropical cyclones, bushfire weather and data assimilation enhancing the Bureau’s international excellence in scientific research. The Medallions are awarded under the auspices of the Australia Day Council to acknowledge employee contributions on special projects that have made outstanding performance of core duties in the year prior to which the award is made. Dr Julie Arblaster: Julie is being awarded the 2014 Anton Hales Medal for research in earth sciences by the Australian Academy of Science. Julie has been involved in, and initiated, distinguished research in the Earth sciences. Her focussed research on aspects of the workings of the global climate system and its sensitivity to change helped to explain many of the causes of climate variability and change. Much of her research pertains directly to the climate of the Australian region, particularly with respect to the ozone hole, El Nino, the monsoon, and Australian rainfall variability. Rod Potts: Rod Potts, jointly with Dr Philip Gill, was awarded the Meteorological Applications Editor’s Award for 2014, in recognition of significant contribution to the journal and editorial process. Dr Matthew Wheeler: At the 2014 annual conference of the Australian Meteorological and Oceanographic Society (AMOS) in Hobart, Matthew was presented with the Priestley Medal in recognition of his outstanding research achievment as a mid-career scientist. Matt is recognised as an international leader in tropical meteorology, in particular as one of the world’s leading experts on the Madden-Julian Oscillation and associated phenomena. CAWCR NextGen Staff: CAWCR has provided much of the science, forecast process, guidance and forecast text underpinnings of NexGenFWS, which provides the forecast data for MetEye. The Project is a collaboration across Bureau Branches including Services, ISS, BMTC and CAWCR. Current CAWCR NexGen staff are Gary Weymouth, Tennessee Leeuwenburg, Michael Foley, Nathan Faggian, James Sofra, Ben Hu, Phil Riley, Tim Hume, Brianna Laugher, Deryn Griffiths and Ying Zhao. CAWCR was one of the major proponents of the NexGen Project. The Asia-Pacific Spatial Excellence Awards (APSEA) recognise the innovation and activities of the spatial industry. The awards were presented as a part of the Locate14 Conference which includes the spatial.gov event. NexGen and Meteye won both their category (Technical Excellence) the overall winner of all categories – the J K Berrie Award for Excellence – the most prestigious award they offer. Dr Martin Cope: Martin received the award on 19th Nov 2013 for his outstanding contribution to improving air quality in Australia through his development of atmospheric chemical models, his inspiring science leadership, and his effective collaborations with all Australian state and federal environment agencies. This award recognises Martin’s achievements in chemical modelling and leadership in the field, and is richly deserved. The Werner Strauss Clean Air Achievement Award is awarded by the Clean Air Society of Australia and New Zealand (CASANZ). Dr Diana Greenslade: This award acknowledges Diana for her excellence in scientific research leadership, especially her work in supporting the Bureau’s tsunami and ocean wave forecasting capabilities, and her willingness to adapt to new scientific challenges. Because of Diana’s dedication to excellence, the Bureau is now in a leading position for ocean and marine forecasting. Diana had a leading role in the tsunami research component and was instrumental in generating the tsunami model database that underpins the Bureau’s operational tsunami warning system. Dr Michael Foley: Michael is recognised for his vision, innovation, dedication and commitment in providing one of the leading contributions to the implementation of the Next Generation Forecasting and Warning System. Michael’s skill and commitment have ensured all regional NexGenFWS implementations were delivered on time. He has been the chief designer and lead contributor to about 120 smart tools that encapsulate the process that transforms gridded model guidance into weather services. Dr Phil Purdam: Phil is recognised for for his vision and innovation in driving the design and leading the development and ongoing support for the Bureau’s state of the art radar visualisation system, (RAPIC). RAPIC provides the Bureau with an unparalleled ability to use and interpret radar data, helping to deliver a range of forecast and warning services. Phil’s very high level technical expertise and meteorological nous, and his eagerness to work closely with forecasters and other users, have been crucial to the success of RAPIC. The Bureau Excellence Awards recognise outstanding contributions from individuals or groups in support of the Bureau’s role and objectives. Dr Kamal Puri: Kamal has been one of the foremost figures in Numerical Weather Prediction (NWP) modelling and earth system modelling for the past four decades. Since the early 1980s he has been one of the key scientific and intellectual leaders in the Bureau’s NWP research. He is highly respected internationally and is a member of key international panels on earth system modelling. Australia Day Achievement Medallions instituted in 1984 by the Australia Day Council provide government departments and agencies with an opportunity to acknowledge the contribution of their staff. The award relates to outstanding performance in delivering special projects or in the performance of core duties. Dr Terry O’Kane: Terry has been awarded the 2013 JH Michell Medal for his outstanding original contributions to difficult and important problems in applied mathematics. JH Michell Medal recognises distinguished research in applied and/or industrial mathematics. Dr Noel Davidson: Noel has been awarded Christopher Taylor Award for his valuable contributions to operational forecasting. Christopher Taylor Award is open to professional meteorologists for contributions of all kinds to operational forecasting and supporting activities in Australia. The Award recognises contributions by operational meteorologists who have either commenced or performed a substantial part of their investigative work, or other contribution to operational forecasting, outside of normal duties. Dr Neil Adams: Meteorologist and scientist Neil Adams has been awarded a posthumous Australian Antarctic Medal. Dr Adams was the Manager of the Bureau’s Antarctic Meteorological Section and spent two decades supporting Australia’s Antarctic program. Dr Adams’ exceptional abilities as a forecaster contributed immensely to the achievement of scientific programs across many years. Dr Steve Rintoul: Steve was awarded the Australian Antarctic Medal for his leadership and outstanding contribution to science and Australia’s Antarctic program. His work has improved the world’s understanding of the workings of the Southern Ocean and its significance in the global climate system. The Antarctic Medal was established in 1987 and is an award in the Meritorious Service Awards category of the Australian Honours System. It is awarded for outstanding service to the Australian Antarctic program. Dr Harry Hendon: Harry is recognised both at the Bureau and internationally for his dedication and commitment to scientific excellence and for his expert leadership of research and development in prediction at subseasonal to seasonal scales. His extensive research work has significantly advanced our understanding of the global climate system and its influence on Australia’s weather and climate and he is widely regarded as a world leader in his field. Bureau Excellence Awards recognise outstanding contributions from individuals or groups for their extraordinary service and performance in achieving the Bureau’s strategic objectives. Dr Jeff Kepert: Jeff has been awarded the 2012 Monthly Weather Review Editor’s Award for providing thorough and constructive reviews of a large number of manuscripts on a broad range of topics. Dr David Griffin: David was awarded the AMSA Jubilee Award for outstanding contributions to physical oceanography that demonstrate a fundamental commitment to the application of great science to serve society. This award recognises a rich career of contributions to oceanography, particularly focussed around developments in ocean forecasting and modelling of ocean processes. Dr Paul Fraser Paul Fraser was recognised as a CSIRO Fellow for his long-running, internationally leading research on atmospheric greenhouse gasses and ozone depleting gases that has both contributed fundamental advances in the science of atmospheric composition and also had profound impact on policies around gas use and emissions regulations and monitoring. Dr Jorgen Frederiksen Jorgen Frederiksen’s CSIRO Fellowship was awarded for his pioneering research into atmospheric dynamics and fundamental aspects of atmospheric circulations that play major roles in weather, climate variability, and climate change. The CSIRO Fellow designation is appointed to exceptional scientists who have displayed eminence in a significant field of science or engineering. Dr. Steve Rintoul: Steve has been awarded the prestigious 2012 Martha T. Muse Prize for Science and Policy in Antarctica for his outstanding research on the Southern Ocean. The Muse Prize is awarded to an individual in the fields of Antarctic science or policy who has demonstrated potential for sustained and significant contributions that will enhance the understanding and/or preservation of Antarctica. Dr John Church: John was elected as a Fellow of the Australian Academy of Science, recognising his outstanding career-long contributions to oceanography and the science around sea level rise. Trevor McDougall: Trevor was elected as a Fellow of the Royal Society for his research which has had a major impact on our understanding of ocean mixing and its representation in climate models. The Fellowship of the Royal Society is made up of the most eminent scientists, engineers and technologists from the UK and the Commonwealth. Terry O’Kane: Terry was awarded an Australian Research Council (ARC) Future Fellowship commencing 2012 to study the stability and predictability of the Southern Hemisphere coupled ocean-atmosphere climate system. ARC Future Fellowships promote research in areas of critical national importance and are awarded to the best and brightest mid-career researchers. 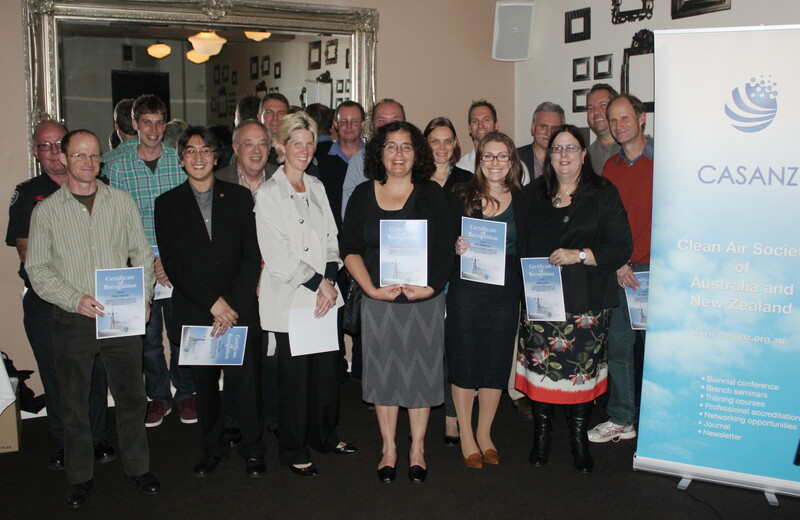 Only three were awarded to CSIRO researchers in 2012. Wenju Cai: Wenju was honored with an award of “Green Card” Professorship at the Ocean University of China (OUC) for his scientific and international leadership in coordinating several multinational programs, and to the mission of the OUC in conveying and developing physical oceanography and climate knowledge, as well as in training young scientists. “Green Card” Professorship at the Ocean University of China (OUC) is a prestigious and the highest honour for overseas Chinese scholars. Savin Chand: Savin was awarded the Uwe Radok award by the Australian Meteorological and Oceanographic Society (AMOS) for the best PhD thesis for 2010-2011 in the fields of meteorology, oceanography, glaciology or climatology. Claire Spillman and Debbie Hudson: Claire and Debbie, together with Alistair Hobday (CSIRO) and Jason Hartog (CSIRO), were awarded the Best Sustainability Initiative Award for their team project on ‘Seasonal forecasting to improve resilience of prawn farms to future climate events’ at the Prawn and Barramundi Farmers Conference, August 2012. Dr Peter Oke: Peter was awarded the 2012 IMarEST Denny Medal for the best paper published in the Journal of Operational Oceanography. The Denny Silver Gilt Medal is awarded to the best paper published over the course of one year in each of the Journal of Marine Engineering and Technology (JMET) and the Journal of Operational Oceanography (JOO). The medal is awarded by IMarEST Council following recommendation from the Editorial Boards and the Proceedings Supervisory Board. Next Generation Forecast and Warning System: The Bureau’s Next Generation Forecast and Warning System won the Overall Excellence and the Geospatial Category at the Excellence in eGovernment Awards in May 2012. The system generates graphics and icons for our forecasts and warnings, freeing forecasters to focus on their meteorological work. Next Generation Forecast and Warning System: The Next Generation Forecast and Warning System was also highly commended at the Comcover Awards for Excellence in Risk Management. The judging panel recognised that the system improved the ability to manage and inform the community about severe weather events, including severe thunderstorms and flash flooding. Dr Claire Spillman: Claire was awarded the 2011 IMarEST Denny Medal for the paper titled “Operational real-time seasonal forecasts for coral reef management.” The paper assesses the ability of an operational seasonal prediction system (POAMA) to forecast summer SST anomalies in real-time across the Great Barrier Reef. The Denny Silver Gilt Medal is awarded to the best paper published over the course of one year in each of the Journal of Marine Engineering and Technology (JMET) and the Journal of Operational Oceanography (JOO). Dr Matthew Wheeler: Matthew achieved the status of Gold Star Editor for his dedication to the journal Monthly Weather Review, based on his timeliness in finding reviewers, obtaining reviews, and making an initial decision for papers submitted in 2011. The Gold Star list recognises the top ten editors across all journals of the American Meteorological Society, based on their average time to initial decision. Dr Trevor McDougall: Trevor received the Prince Albert I Medal for his outstanding work on (1) important and fundamental problems of ocean fluid dynamics over the full range of ocean scales, and (2) the thermodynamic properties of seawater. The Prince Albert I Medal is awarded to a scientist who has made outstanding contributions to the enhancement and advancement of the physical and/or chemical sciences of the oceans. Dr Jan Zika: Jan was awarded the Uwe Radok award by the Australian Meteorological and Oceanographic Society (AMOS) for the best PhD thesis for 2009-2010 in the fields of meteorology, oceanography, glaciology or climatology. Dr Jaclyn Brown: The CSIRO Payne-Scott Awards are designed to support post doctoral fellows and research scientists who have taken extended leave to care for a newborn child following birth. The grant provides support to researchers to re-establish themselves and reconnect with the research underway in their field and related fields of research. Dr John Finnigan: John received this designation for his fundamental contributions to the measurement and modelling of atmospheric flow over complex terrain. His work has wide theoretical and practical applications. Dr Mark Hemer: Julius Career Awards are designed to enhance the careers of exceptional early to mid-career scientists. The aim is to develop and retain outstanding early to mid-career scientists with a view to enhancing science quality and reinforce a culture of scientific excellence. Dr Wenju Cai: The CSIRO OCE Science Leader Scheme is directed towards high-performing scientists with between five and ten years post doctoral experience. It provides resources and freedom of research direction to allow awardees to deliver outstanding scientific impacts.